The mustard and croûtons can be made in advance, while the steaks will be sizzlingly succulent in minutes. For the homemade beer mustard, place the vinegar and sugar into a non-reactive pan and bring to a simmer. Add the yellow and brown mustard seeds and the mustard powder and stir well. Simmer over a high heat for three minutes, until the volume of liquid has reduced by half and the seeds have softened slightly. Pour the mustard mixture into the bowl of a food processor and blend to a purée. It will take a few minutes for the seeds to break down and the mustard to become creamy. For the steak, heat a griddle pan until hot. Rub the steaks with one tablespoon of the olive oil, then season to taste with salt and freshly ground black pepper. Place the steaks onto the hot griddle and cook without moving for 1-2 minutes, then turn 90 degrees with tongs and cook for a further minute, to give the steaks a lattice pattern of griddle marks. Turn the steaks over and repeat the process on the other side. Remove the steaks from the pan and place onto a plate to rest; keep warm. Meanwhile, for the salad, heat the remaining oil in a frying pan, add the bread cubes and fry for 2-3 minutes, turning occasionally, until crisp and golden-brown. Remove the croûtons with a slotted spoon, drain onto kitchen paper and season to taste with salt and freshly ground black pepper. Place one teaspoon of the homemade mustard into a large bowl. Add the cider vinegar, whisk in the rapeseed oil and season to taste with salt and freshly ground black pepper. Add the croutons and watercress and mix well. To serve, cut the steaks into thick slices and spoon the mustard into 2 small pots. Pile the salad onto the centre of each plate. 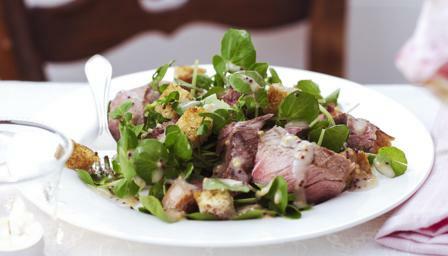 Lay the steak over the salad and serve with a mustard pot on the side.